Authors: C. F. Manara et al. The ‘classical’ paradigm of the evolution of circumstellar disks – the swirling matter around young stars from which planets form – is centered around an intrinsically important parameter: the ‘disk viscosity’. It determines how material around the star is accreted onto the star and how the disk evolves over time. Mathematically this ‘viscosity’ is a fudge factor – a scaling relation introduced to express our ignorance about the dominating physics of disk evolution. The theory is derived from large samples of observations and works very well most of time, even if it is centered around this one factor which contains lots of unknowns. In fact, this approach works so good that researchers were able to verify several predictions from the model. This paper by Manara et al. explores another one of these predictions: the idea that the more massive a circumstellar disk is the more matter the host star will accrete. To check this, the researchers analysed a large sample of young stellar objects with circumstellar disks from the mighty Atacama Large Millimeter Array in Chile (ALMA), the best data we can get nowadays. ALMA is used to measure the dust component in the disks, but that is only a small portion of the overall mass – the rest resides in gas. Analysis from ‘viscous theory’, described above, indicates a correlation between the accretion rate of the host star and the mass of the dust component of a disk, which the researchers try to confirm in Figure 1. Fig. 1. Correlation of logarithmic accretion rate onto a young star versus logarithmic mass in dust of the corresponding circumstellar disk. Green dots show the measurements with uncertainties. Different shapes indicate ‘transition disks’ (circles), which are oddities with cavities inside, main objects from the sample of the Lupus region (filled squares) and disks which are edge-on from our point of view (square with cross). The thick bright red line shows the best fit to the data, derived from a statistical method based on many iterations of the sample set (thin lines). Even if there’s a significant spread in the data the measurements confirm the relation between the accretion rate and the disk mass. However, that seems to work only if we assume that the amount of dust, i.e., the solid content of the disk, is always the same relative to the mass of gas in the disk. Figure 2 shows that something does not work if they check the same relation just from the gas mass. Fig. 2. 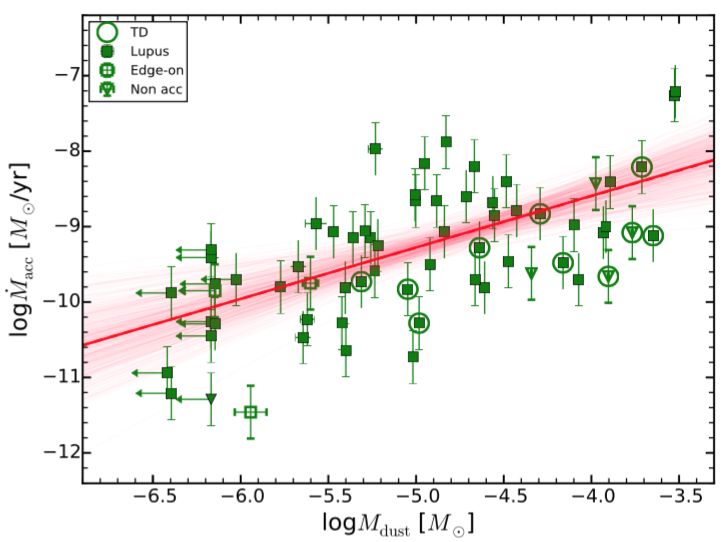 *No* correlation between logarithmic accretion rate and logarithmic gas mass in the disk. Symbols again denote measurements with uncertainties for various objects. The dashed black lines indicate ages for the disks calculated from viscous accretion disk theory. First, there is not obvious correlation of the two quantities. Second, some of the disk ages are at odds with the ages suspected from other calculations. Actually, the objects here should mostly be within the 1-3 Myr lines. What do these two plots show us? First, there is indeed a correlation as predicted from viscous accretion disk theory. This is good news, as it shows that the theory still does make good and verifiable predictions, and we can trust it in certain limits. Second, something is wrong with the correlation when we check it for disk gas content. The gas masses derived for Figure 2 come from measurements of specific CO molecules in their gas and lead to ‘wrong’ results. 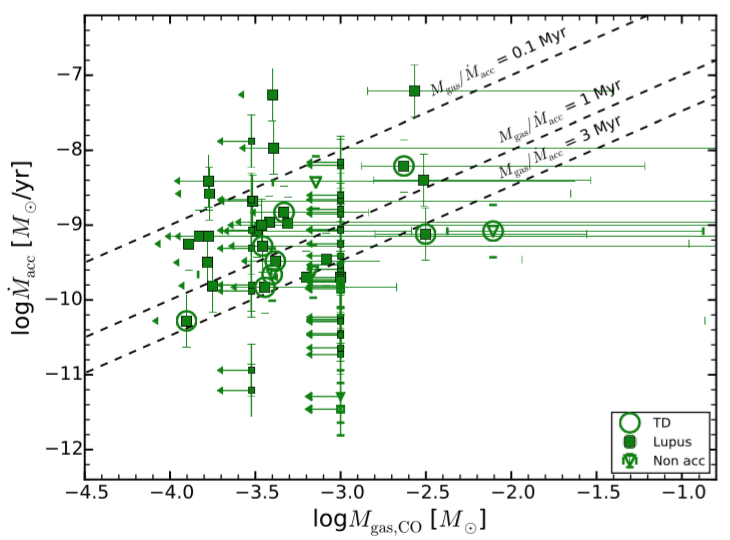 However, if the researchers redo the same analysis with disk masses where they just multiply the values from Figure 1 by 100, the ratio of gas to dust usually assumed for the interstellar medium, the derived ages for the disks are in agreement with the real ages inferred from other methods. This suggests that using the factor 100 for the gas/dust ratio is reasonable here and could mean that something about the CO isotope as a ‘tracer’ for the disk mass is incorrect. Future studies should incorporate this bias. Indeed, from other studies there is already evidence that carbon undergoes more complex chemistry in massive disks, which would negate the direct correlation of CO mass relative to total disk mass. Additionally, with measurements like the ones done here we can better understand the evolutionary processes in disks, which we need for a better understanding of, for example, the timescale of the formation of planets. Sneak a peek on the cause of death of protoplanetary disks Do planets form inside-out? An Overview of the Extreme Solar Systems III Conference Stuff Between the Stars: Gas, Dust, and… Asteroids? Interesting paper, it would also great to have such observations extended to circumnuclear disks around black holes in AGN.